This is a recipe I put together yesterday after having sweet potato soup recently suggested to me as a soup idea. Sweet potatoes contain vitamins B, C, D, magnesium, potassium and beta carotene. I looked through a few recipes and came up with this version. The red lentils add an extra nutritional boost as well. I quite enjoyed the thick texture and rich taste of the coconut along with the spices, which have a slight curry flavour. In a large pot, saute onion, garlic, apple and sweet potato until softened. Add vegetable stock and red lentils, bring to a boil. Add creamed coconut, cumin and tumeric, stir. Add lemongrass and cilantro stems. Simmer until sweet potatoes are very soft. Remove lemongrass and cilantro stems. Use a handheld immersion blender to puree the soup. Season with salt, pepper and lemon juice to your taste. Enjoy! Lobster tacos were always amazing at Bymark http://bymark.mcewangroup.ca/with their slight Asian influenced flavour. Their shrimp version is quite good as well. Sometimes, I am lucky enough to have lobster cooked for me by my parents. Then, I make lobster sandwiches for our family. The inspiration for lobster tacos came recently when my mom mentioned she couldn’t have a lobster roll while she is not eating bread. Here are the loose recipes for both a lobster roll and a lobster taco. The taco idea can be used as a gluten free substitute for various sandwiches, if the soft corn tortilla is appealing enough for you. This is a loose recipe for whatever quantity of lobster you have on hand. I would suggest 1 tablespoon of celery, green onion, and mayonnaise for every cup of cooked lobster you have. 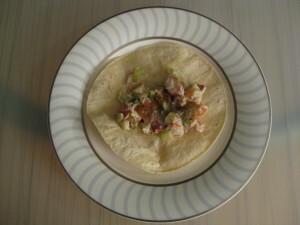 In a bowl, combine lobster, celery, green onion and mayonnaise. Season mixture with Old Bay seasoning, lemon juice, salt and pepper to your taste. Spoon into sliced rolls-enjoy! Warm tortilla in a pan. Spread guacamole onto tortilla and top with chopped lobster, cilantro and hot sauce. Enjoy! How often do I enjoy these foods? What is the variety of food on my list? Are there any veggies or fruit that make it onto my list? What tastes and textures do I seem to like most? What is the satisfaction or feeling(s) that I associate with each food? I must say fried chicken is perennially on my top 10 favourite foods list. I enjoy it about once a month or less. Fried chicken is a food I have loved since I was a child. I love the savoury, crispy, and greasy tasty satisfaction it gives. I eat it here in Toronto and I also associate it with being on holiday-I have had some fantastic fried chicken in Barbados, Hawaii, Jamaica, and San Francisco. Galerie au Chocolat Fire is a taste sensation that was mentioned to me in April and introduced to me at Whole Foods in October. I have consumed a couple bars myself and have introduced many friends to the product as well. Fire like the name suggests is a dark chocolate that is spicy. It is a rich, fine dark chocolate that has a little kick of heat that builds up slowly. Galerie au Chocolat Fire is my favourite chocolate with chili I have tried so far. The intense flavour itself provides portion control is what some friends have observed. They feel one square of this chocolate is enough. This is so true-enjoying food with highly satisfying flavour and texture is a built in form of portion control. I learned of this recipe while sharing lunch with a generous young lady from Tanzania a couple weeks ago. This is a homemade hot sauce that is also known as pilli pilli. It can be served with grilled meats or anything else you enjoy with hot sauce. Here is my version of the free form recipe with scotch bonnet pepper and tomato being the key base ingredients, then you add other ingredients to your taste. It is important to use scotch bonnet or habanero pepper for their flavour. Lime and sugar are nice additions to round out the heat. In a food processor, puree all ingredients. Adjust seasonings to your taste or add any other variation you enjoy, such as, garlic, onion, ginger, lemon, etc. My favourite pie is still Wanda’s (their apricot pie is my absolute favourite). I prefer the Wanda’s Pie in the Sky crust and the reason seems to be the taste of butter. Wanda’s pie crust is made with 2/3 butter and 1/3 non hydrogenated trans fat free shortening. Madeleine’s pie crust is 100% non hydrogenated trans fat free shortening (more vegetarian friendly). The Madeleine’s sour cherry filling does have a slight edge over the Wanda’s sour cherry filling. So, both sour cherry pies are outstanding, as they are both made by amazing pie makers. 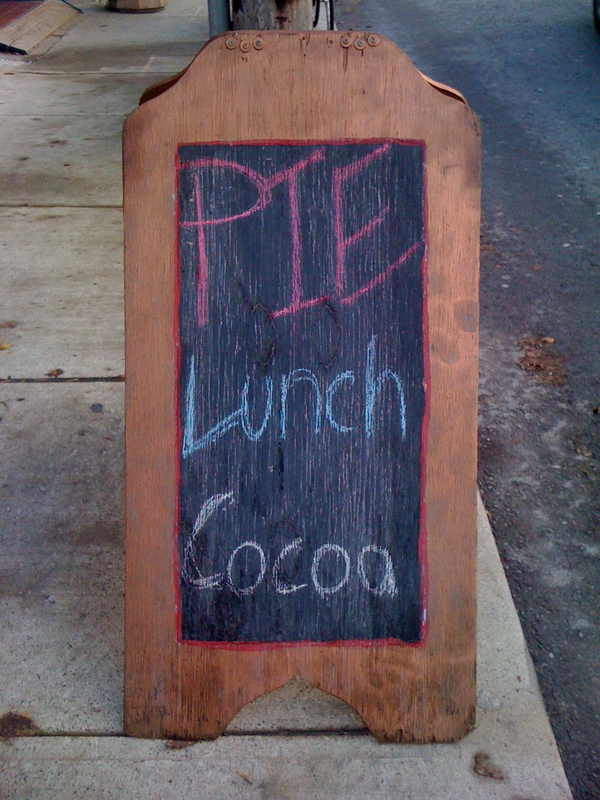 Pie is not an everyday food. It is a special treat to be shared and enjoyed with love. Most people will say what they want in life is to be happy. However, we all know that it is not quite possible to be feel happy all the time, and ‘happy’ would have an entirely different meaning if it were a constant state. There is an enormous range of emotion we all feel throughout our journey in life, and all is impermanent. So what does it really mean to be happy? An important question to ask ourselves and the answer will be unique for each of us. For myself, I will share that much of my philosophical outlook on being happy is expressed in my previous post on practicing truthfulness. Having your words always come true sounds incredibly amazing, doesn’t it? However, the practice of truthfulness is challenging. It requires that we are committed to the truth and speak the truth, even though avoidance may feel like an easier option. The most challenging part for many of us, is to be truthful to our own heart, inner calling and our true higher purpose-to live our own truth. Even when we find clarity in our heart’s desire, courage to is needed to live our truth. Living our truth may require us to go far outside of our comfort zone, take risks, and make choices that help us to transcend our current reality, constructs and expectations. We know we are living our truth when we feel love in our heart and peace within our whole being. Peace, contentment and happiness are likely to come from this practice, if you are mindful of your words, especially when they come true…Your words are your wand when you are being perfectly truthful. Avocados are a healthy super food with their high monounsaturated (healthy) fat content, fiber content, vitamin A, vitamin E, vitamin B, vitamin C, copper, and lutein for the prevention of macular degeneration. My favourite way to have avocado is in guacamole. Here is my take on guacamole, everyone has their own, so make it your own with your own additions. I use shallot as a cross between onion and garlic. I feel cilantro and jalapeno are required for zip and spice. In a medium bowl, scoop out avocado, mash with a spoon and mix in lime juice. Add tomato, shallot, jalapeno and cilantro, mix well. Season with salt and pepper to taste. Place the avocado seed in the guacamole if you are not serving it immediately to help prevent browning. Enjoy with tortilla chips, crackers or with tacos.